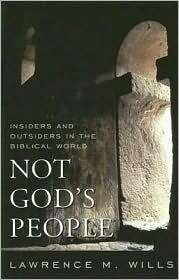 Description: Using an array of biblical texts from both the Hebrew Bible and the New Testament, Not God's People explores how ancient Jews and Christians created their own identity in relation to others. The book analyzes how biblical texts define 'us' and 'them,' how these texts differ in the way they define group identity, and how this process continues to be re-created by Jews and Christians today. Citation: Lara van der Zee-Hanssen, review of Lawrence M. Wills, Not God's People: Insiders and Outsiders in the Biblical World, Review of Biblical Literature [http://www.bookreviews.org] (2009).